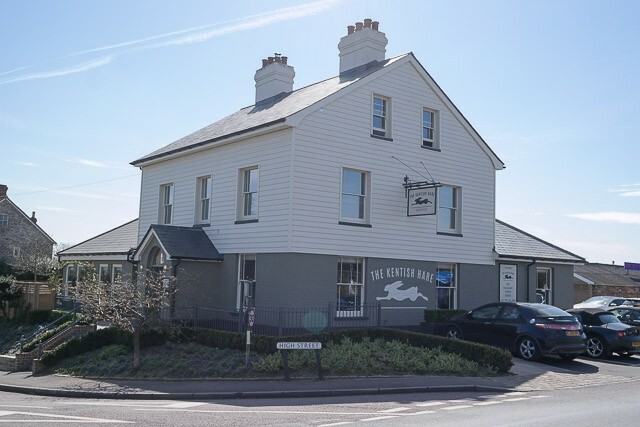 I was looking for a good Sunday lunch a short drive away and found The Kentish Hare in Bidborough (near Royal Tunbridge Wells). 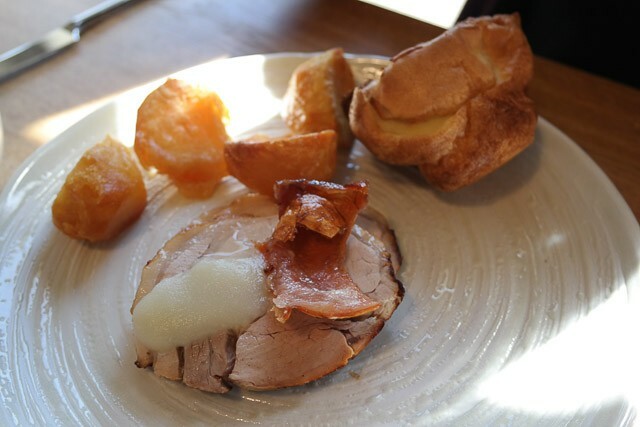 It had been regarded very highly, even scoring 2 rosettes from AA – so I booked online through their website for a Sunday lunch. Bidborough is a pretty area, The venue had a lot of parking spaces. We were shown to our table at the back, with large glass doors to the garden and our table was laid out. I ordered a Curious Brew, Claire asked for a glass of processco. We thought we’d push it with getting starters, as JW could share some of the meat from the charcuterie plate – so that’s what Claire ordered. I asked for the Chicken Liver Parfait. Service was quick, and the food was very nicely presented. 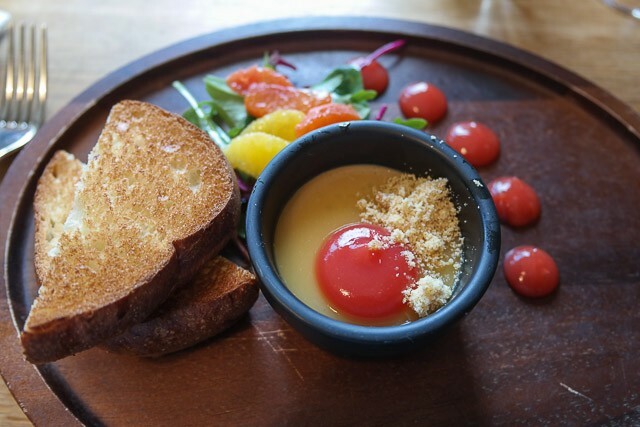 I had an orange salad on the side, along with two slices of toast (which was a good amount – normally, one receives a very small slice for a large amount of pate/parfait). The dish was very fresh tasting (obviously a bit heavy, being parfait) and very nice. Claire was pleased with her choice with a huge slice of bread. 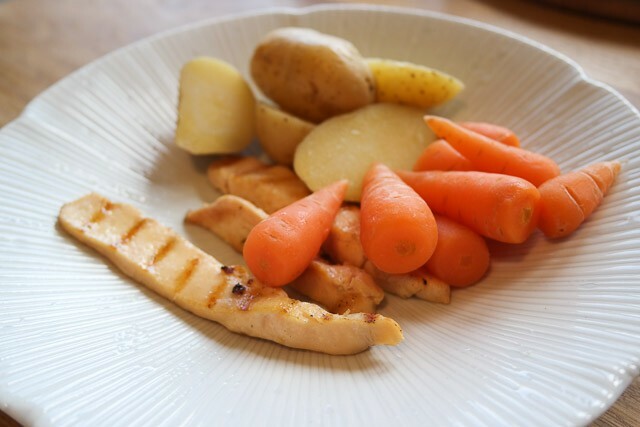 For Sunday roast, we ordered JW chicken stripes with new potatoes and carrots (as he’s gluten / dairy free). Claire ordered the roast pork, I asked for Roast Beef. It was served quickly after our starter, and consisted of 4 roast potatoes, a yorkshire pudding, a couple of slice of meat, a side dish of vegetables, a jug of gravy and, more importantly, cauliflower cheese (my absolute favourite). Tucking in – it was delicious. The roast potatoes were perfectly cooked, a good size and very crispy. The beef was wonderfully tender, as was the roast pork. 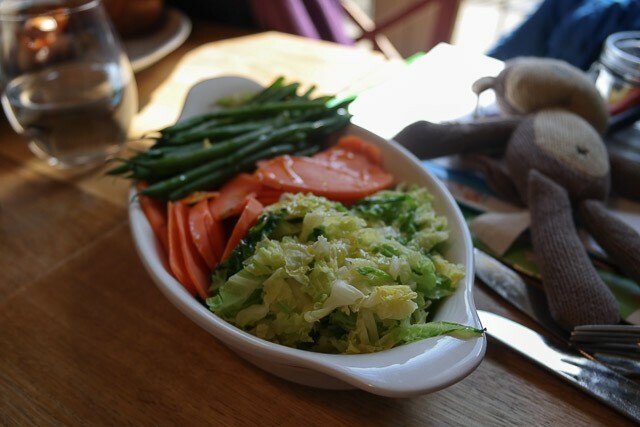 The vegetables were cooked nicely, being carrots, green beans and some cabbage. The gravy was flavoursome and tasty. 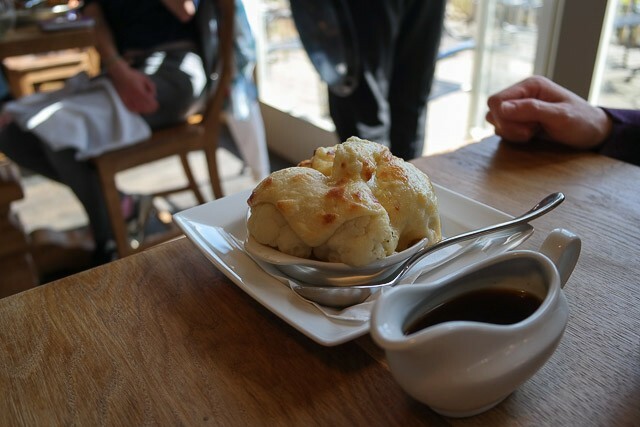 Lastly – the excellent cauliflower cheese, cooked to my liking! With such a great Sunday lunch, we really needed to give the desserts a try. An interesting variety, Claire ordered the (deconstructed) Vanilla Cheesecake, I asked for a recommendation which was the chocolate brownie sundae. 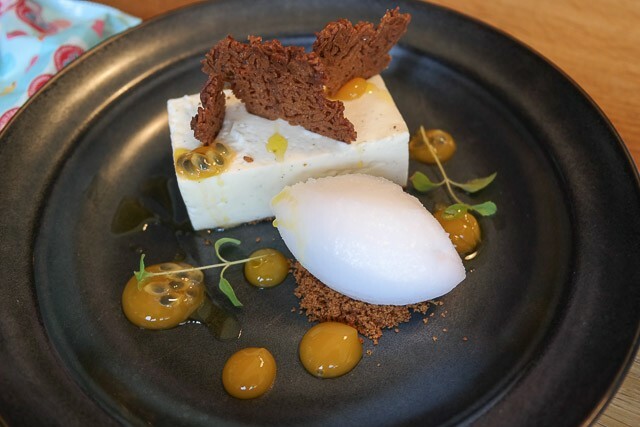 Claire’s cheesecake was beautifully presented and she really enjoyed it, especially the gin and tonic sorbet! 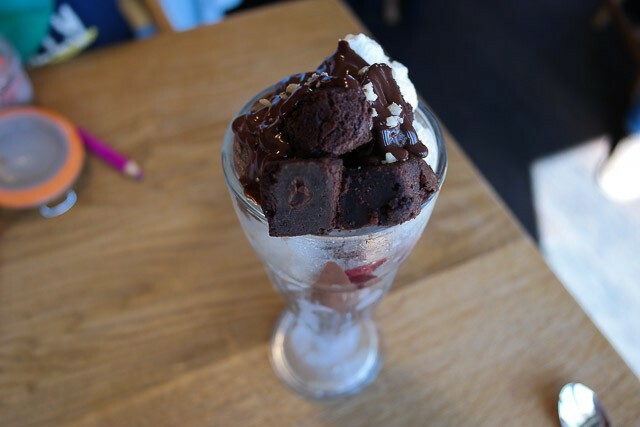 My chocolate brownie sundae was very filling, but that didn’t stop me from finishing it! 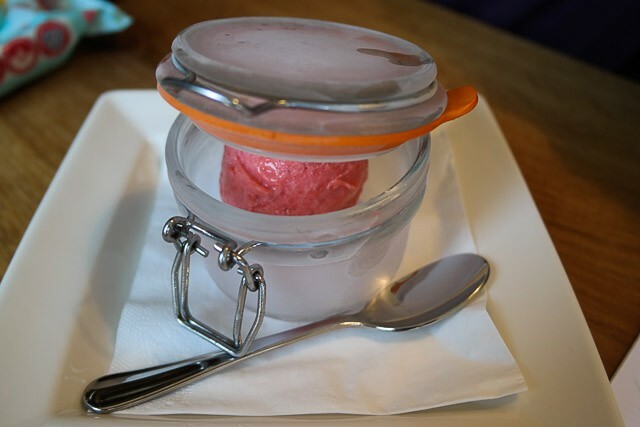 They brought out a sorbet for JW, in a pretty kilner jar. We didn’t need to use any baby changing facilities. The children’s choices were good, we were pleased we could get a “proper” meal for JW (instead of the usual burger and chips option) – it was good they could easily accommodate JW’s dietry requirements. Whilst we were the only people with a toddler, we were not feeling awkward at any point. I knew our visit to The Kentish Hare would be a good one but I didn’t expect it to be quite so enjoyable. The staff were friendly and helpful, the venue was so smart yet relaxing. Our food quality was top-notch with excellent presentation (not to mention delicious). 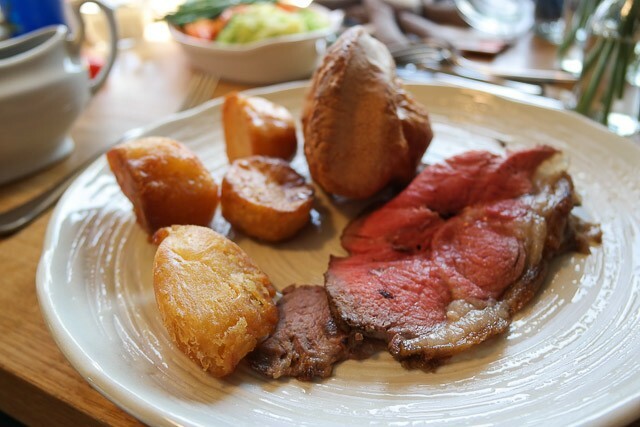 A Top Rated Sunday lunch at The Kentish Hare – recommended for all, whether a family, couple or group of friends.